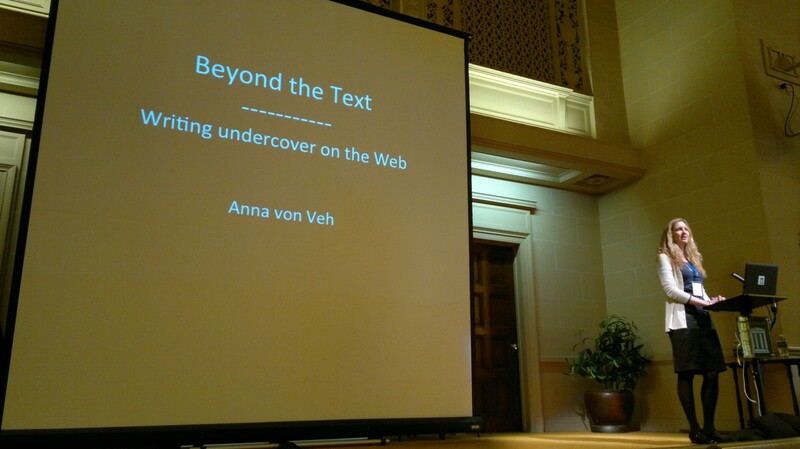 Here are live conference notes taken Thursday October 24th during the Books in Browsers 2013 conference at the Internet Archive, San Francisco. 99.3% opted in for email alerts. i still found it very primitive. not a very good user experience – flipping over from the book to the browser. bringing analytics and freebies right into the ebook experience. amazon does it all the time, through Whispersync. it gets all back to the cloud. You can’t as a publisher call Jef Bezos hotline, and get all that data. Analytics behind the scenes, cookies, flash-cookies. What’s wrong in ads inside an ebooks? The text has words, the words are semantically meaningful. Targeted ads can drop the price of books, they can be available for free. publishers are happy, get more books distributed. this is simple prototype code. the script is posting data behind the scenes. could submit http.send(“user=username”), or anything else. other method: loading a 1×1 pixel video, behind the scenes. that’s my trojan horse. not the best way of doing it, but it works. Introduces BookGenie – “we have 200+ attributes of data for each book”. Apps vs. Ebooks – i don’t think apps will play well with the ecosystem in the future. Running the Radical Publishing Project. 1999: i spent a year and half as artist in residence at Xerox Park. XFR – experiments in the future of reading. Made artist books with networked, digital tools. It was a hackers environment, with people from MIT media lab. The radical publishing project: a way of continuing that project. Research on the future publishing. introduction of my colleague: A “famous book artist” (oxymoron). “the fact that he is my employer affects in no way my appraisal”. Photos of lead type, large printing machines. Shows examples of artist books. SOnia Delaunay, 1913. Hacking technologies and assumptions about books, produces new genres. Difficulty: general lack of visibility of the art form. Idea: parallel, physical and digital editions. In the first phase, the project will include iPad apps (ported to android later), to explore existing artist books. Phase two: commissioning new artist books with apps. Visibility and access. For the digital work, question of the archive – how to keep them alive for 20, 100 years. First two books in that project. “Four monologues” – here is a real copy. Description of the artist book. Electronic version: includes a film version of the monologues, also information on design and construction of the book. Historic contextualizing. App format as a contained environment. Another work: “Long Slow March” – an offset book from 19. Topic: civil rights struggle in Alabama, march on Montgomery, in 1965. Heart of the book: a visual record. A visual reenactment of the march. Documentary photographs, expressive collages. Printed in a typeface designed by the author. Wheel structure. Interactive and collaborative text. Interaction with iPad app – screenshots of the app in progress. Expanded book, QR codes, camera. Images of a current show, calligraphy, photos and 3-d printed pieces. Working with hands. The main feature of the human hand: the opposable thumb – it was not created to hit the spacebar. Reason for the DYI program, the letterpress workshops: using your hands. We need to support more creative writing programes with media from top to bottom. About Dickens – as an entrepreneur/publisher. Serial novels of 19th century. Lady Audrey – completed 80 novels. it was the “50 shades of grey” of the 1860s. Literary fiction vs Sensation fiction/Genre fiction. T.S. Eliot: prose should be interesting. Dostoyevski. Uncle toms cabin – 300.000 sold the first year. Most fan fiction is serial fiction. 50 shades of grey, started as fan fiction. Interesting: what the “advance buzz” of serial fiction can do. Big books are first published as serial fiction. my first experience of interactive media was hypercard. then playing with director, flash, websites, now ebooks. i want to find the commonality of all interactive media. focussing on the experience it creates for the audience. interactivity is what you *do* – not what you watch, not what you read. the meaningful actions that a user takes to interact with the work. THe experience *is* their actions. the audience has no way of reading our minds. the whole experience is mediated. we have to think about the work as the “experience” that the user has when engaging. The objects, widgets, on the screen – it’s objects all the way down. Series of buttons, made of series of states … it’s not time-connected like in a novel. We can’t necessarily predict the relationship. Tetris. ((()) idea of a game with the same gameplay but instead of bricks, you need to stack corpses- just by changing the context, you shift the entire experience into something horrific. Play – “free movement within a rigid structure”. every single bit can be playful, or not. interaction can be turned into a game experience. You cannot make “non-interactive” interactive. a piece of interactive media is composed of different actions. Perspective in painting: came from a demand in experience. Ibooks author is a horrible idea. Asking designers to fit in boxes. You are abandoning a large part of the authorship of your work. The programmer is a co-author – they have so much influence on the result – more than an illustrator, typesetter, designer. Horrible: pre-built blocks, an app. You finish with cookie-cutter media artefacts. The tragedy of design fads. Ibooks copying the book metaphor. The actual problem: it’s non-functional. The pages don’t show how much is left. The “war between skeumorphism and flat design” – completely ignores the issue of interactive design. Flat design: assumes expertise of the user. Final pitfall : from the perspective of the user, all experiences are linear. but there’s not necessarily an end. there’s a suspension. interactive media: not a linear artefact. it has a linear experience. A gloriously designed printed book. and interactive bits were spread out in Bristol, in wifi hotspots. Cues. The story was about an alternate-universe Bristol. Message from the other side. Playfulness: the text responded to the touch. some moves, disappears, can be acted on. Had a few issues that were difficult to use. But it made money: people like buying souvenirs. People are more willing to pay for a printed book. It was a fixed time event. Planned to be done in new cities, each would be different. He is a spin doctor. in the app – you get access of his emails. plots taking place in the political establishment. Voice mails. It replicates the entire phone experience. Uses the metaphors and language of mobile phone experience, incredibly interactive. And very funny. you have access to his dropbox also, secret government files. – this app wasn’t sustainable, it closed. people aren’t willing to pay money for it. an author has control over the pace of a chapter, and the reader of his speed of reading. in interactive media, that control is lost. the printing press: the story fixed in specific container. private ownership of a story. combination of two modes of storytelling. dynamic. deeply collaborative and social ( oral traditions). but doesn’t ignore traditions of the written book format. the internet has given it shape. it started in chatrooms, discussing books and games. it still does function for the need s for the fanfic community. daily updates, comments on the stories. beta-readers, editors behind the scenes. very active, but not very attractive. aimed at a younger demographic. has stuff not allowed in FanFic (fiction about celebrities). new zealand invention : can add soundtrack to books. time… = allows to give timelines to your stories. ComicCon: where a huge amount of interest is generated. I am a fan – that’s how i came to fan fiction – of a movie/series, “Castle” – murder mystery comedy drama. Tumblr: one of the most important platforms for Fanfiction. shows how much time fans devote to the worlds they engage in. we should be embracing these people. they are marketing beyond any dream we can imagine. video “Closed Encounters”: used snippets from different episodes. overlaid with text. The Death of the reader. its a specific take. the empowerment of the reader, to stop being dependent of publishers. Found myself in the place of publication through FLOSS manuals. developed platforms, and methodologies, for knowledge production. A person with knowledge needs – talking outside of fiction books. I want the define the reader as not necessarily someone who consumes what the publishers make. The reader is something else. Typically we think about readers waiting for knowledge artefacts to be released by the publishing industry. COllaborative knowledge production: can be produced for your own needs. Instead of waiting for a publisher, go and produce the book. Strong end: other things. One thing are book sprints. but it’s not the only item (but what i have knowledge of). a small, fantastic NGO. all bout Oil Industry transparency. Johnny West, founder and CEO. Needs a book, so he can do workshops. in his network, he noticed other people need this book. Snippet from his CV. “international Petroleum Transaction” course at some university. He is also a lawyer. Needs a text book for his teaching. long list . NGO, contract lawyer, from Sierra Leone, Uganda. People who know this things intimately, from different sides of the fences. So what do they do? They hire me … they don’t wait for publishers. It’s a strongly facilitated process, but very egalitarian. Shows some ambient photos of the process. One of the most important things: eating, talking, living together in the same room. So they make a book. Conceptualize it, outline it. Proof read it, do everything. At the end, they send it to the printer, PDF, mobi, epub… All in 5 days. Second book sprint lined up, on mining contracts. 2 localization sprints planned, to make it more specific for some countries. It has transactional value, it has authority. From what i understand from people inside of that system. You don’t have to be the person who just consumes. You can produce the knowledge yourself. Through strong collaborative knowledge production. It has a massive and very important future. Q: talk bout the facilitation process. Adam: that methodology, booksprints, drives out of Unconference methodology (quotes name) … “all the cool stuff happens in the cafe” – “make the cafe the conference”. founding principle: non-hierarchical, facilitator makes connections. Adam: i think most people would probably die. Q: fundamentally closed models of production? do you see “LeenPub” vs booksprints. Adam: wanted to illustrate there are CKM. we need to know how to make them, through experience. 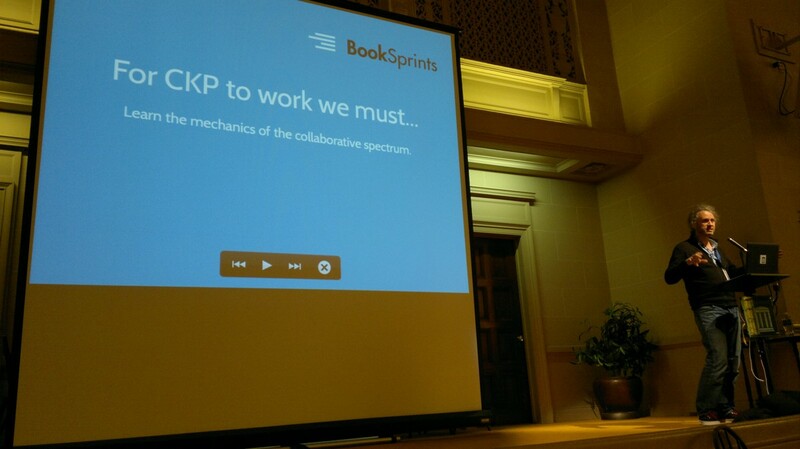 book sprints is one point on the spectrum. but i don’t see much experimentation in that area. Experience is critical. Q: teachers say all the time “the students aren’t reading”. is there a way we can direct readers towards things that do have quality?